The urbanista's grocery-carrying solution, in photos. Editor’s note 4/19/16: We’re re-posting an old favorite today in honor of Earth Week. In a compact neighborhood, what’s one of the most helpful vehicles? A grocery cart! And even six years ago, styles were looking up. Have a new favorite of your own to add? Let us know in the comments section. Transport guru Todd Litman says the biggest vehicular breakthrough of recent decades is the rolling suitcase. That’s not the conventional wisdom. Most recent attention to the wheels of the future focuses on electric cars, and they are clearly essential. Still, for some, they are also a false hope, suggesting that all we need to change is our drive trains, not our auto-centered way of life. If our future is to be sustainable, however, the role of cars—electric or otherwise—will have to diminish. The obesity epidemic, the range limits of electric batteries, the pressing need to get off the carbon-fuel rollercoaster as soon as possible, and other challenges suggest that changing vehicles’ power source is only part of the solution. In the end, the real alternative to automobiles is not better automobiles; it is better neighborhoods. Complete, compact communities enable walking, cycling, and transit to thrive. They make electric vehicles’ limited range adequate. And they allow cars to fill their rightful place as one transportation tool among many, rather than as the organizing principle of daily life. It’s in the context of better neighborhoods—dense, vibrant, beautiful, mixed-use, mixed-income, mixed-age communities—that rolling suitcases are a vehicular breakthrough. Well-wheeled luggage is a vast improvement on the lift-and-carry type, and it is actually just the beginning of the innovations in human-powered motion. This post on the wheels of the urban future launches a short series on the subject. My frequent collaborator Alyse Nelson, an urban planner, assembled the photos. The series expands on this pictorial ode. The traditional personal shopping cart is a collapsible, wire-grid cage with two or four wheels. It’s as utilitarian an option as it was for my car-less grandmother in the 1960s. Better models easily support more than 100 pounds, and if you don’t like the styling, you can trick yours out, as Instructables.com details. Newer designs include more maneuverable canvas carts, which collapse like an umbrella. These trusty carts, however, are rapidly giving ground to better engineered and more expensive models, some smaller and others bigger, and many of them documented at Cities21. Among the smaller models are several scaled like wheeled luggage, carrying just one or two sacks of groceries. A popular model by Roadrunner has a three-wheeled design that allows it to climb stairs. The even smaller Foldable Trolley by Reisenthel folds up—wheels and all—inside its own handbag-sized pocket. Some models impersonate a shoulder tote when folded but have a telescoping handle to operate like wheeled luggage. Thoughtful design makes it versatile. The manufacturer Rosler, meanwhile, offers a vast array of European-made (and styled) carts in bright colors, some sturdier, some more easily folded. This one, for example, folds and hangs from a grocery’s shopping cart while you’re in the store. A UK competitor—the Typhoon Spotty Trolley—is insulated to keep your groceries cool. And folding hand trucks such as this one and this one can haul the heaviest loads. A minimalist design from California is a rolling hanger for shopping bags. Its lack of a carrying basket of its own makes it easier to fold and, therefore, to stow while shopping. The best built carts, in my view, are baby strollers with cargo capacity (and convertible bike trailers, which I’ll discuss another time). They cost hundreds of dollars, and that’s a lot of money compared to a granny cart. On the other hand, it’s peanuts compared to a car. Photo by Alyse Nelson, used with permission. …and here is a look at the cargo capacity of her stroller. Big-wheeled jogging strollers such as this one have more capacity and easier handling than the standard type pictured above. Some can even accommodate panniers, for added storage. But they also cost more and take up more space. In time, as cities grow increasingly walkable and more people want to do their errands on foot, I expect that personal carts and baby strollers will essentially merge, with interchangeable fittings and modular components for kids and groceries. (They will also merge with bike trailers, as I’ll argue another time.) Communities that are eager to promote walking will also find ways to accommodate them: providing easy, secure parking in shops and cafes, and welcoming them on buses and trains. At present, as Alyse points out, you can’t bring a cart or stroller on a bus in the Northwest without emptying it and folding it up first (editor’s note: a 2013 update here!). In Denmark, in contrast, strollers have a place on transit, just like wheelchairs. Next time: community cart programs. Huge thanks to Alyse Nelson for researching this post! Whatever happened to the even more maneuverable backpack for many of these purposes? The arthritis in my hips and spine, that’s what happened. Two of my vertebrae have fused together due to this very painful condition. I appreciate this post, and a wheeled cart is much easier on the shoulders and back than a traditional back pack. I’ve been trying to fix some neck and back problems, so being able to find reliable ways to wheel things around the city is important to me, and backpacks don’t help with my back problems. So, thanks for helping seek out some of the nicer wheeled carts that are out there. Steven, I use my shopping cart everywhere I go. I used carry a backpack as well and I it led to really bad back pains. Now, I don’t try to carry anything, I take my cart with me. Also, I purchased a Pak that really has alleviated my pains and stress. It holds my bottles and other stuff that I used to have to balance or tie to the handle of the cart. I love it. I live that European style! 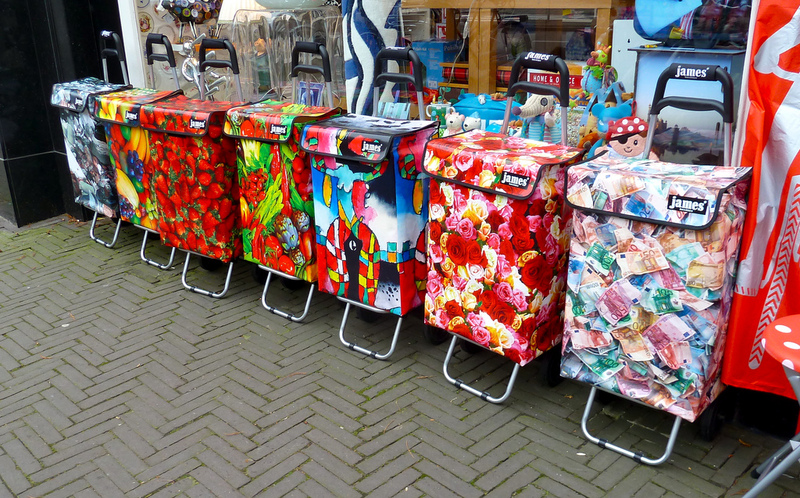 I worked on a project with Feet First a few years back to distribute some classier carts to people who lived near grocery stores. It was just a pilot study, but had a positive impact of more local residents choosing to walk to the store. People seemed happy to walk with the cart if they could carry enough to make their trip feel worthwhile and that they didn’t feel embarrassed toting it. Talking to participants, time and again people told me that cart use is really common in many other U.S. cities, and the northwest has just missed the train. Thanks, SSW.My next post, which we’ll probably publish next week, mentions the Feet First pilot. It’s good to hear your experiences. When my wife and i lived (car free) in a urban townhouse a few blocks away from several grocery stores, we used our ‘granny cart’ all the time. We found it far better than our backbacks for carrying heavy items like milk, bags of flour, etc. It’s great to see that both form and function have improved considerably. Hopefully this will increase their use and decrease the amont of trips people feel they need to take by car. Sturdy wheeled luggage—the kind that’s meant to traverse streets and not just airports—makes it easier to use public transportation for travel. For example, in Portland, I take the Max light rail train to the airport ($2 or so) and when I return, I can walk home with my suitcase rolling along with me. So no need to drive or take a taxi. (If I lived farther away from a Max stop, I could take the bus.) When traveling in Europe last summer, I did the same thing, hauling my suitcase in Spain and France so I wouldn’t need to rent a car or take a taxi. Alan,Nice article! Great to see that some of the designs on the granny cart are getting improvement. I had a granny cart and used it however it had two flaws (one proving fatal) 1) the handle was too short and not comfortable even for our short walk to the store, maybe ten blocks each direction and 2) it could not handle much weight, it collapsed on a halloween canned food drive that our kids participated in and that was then end of it… We usually walk and carry bags and limit our purchases, ride a bike and fill a backpack and or panniers (and still watch the amount purchasing) or drive our electric car and use reusable bags… great article, thanks! And by the way, I’ve seen many more younger people than older using these carts. The young/disabled who can’t afford cars use them frequently to transport groceries/items from the neighborhood stores. So maybe you should call them poverty carts. Poverty carts, eh? Guess he only cured you of being polite to old people. Go to quirky.com—they are working on just such an updated cart now! Excellent site. A lot of helpful information here. I’m sending it to some friends ans additionally sharing in delicious. And naturally, thank you for your sweat! Do you guys bring the cart into the store, or leave it outside and then load the groceries into your own cart? What are the mechanics of using it? I tie it folded flat to the front of the store grocery cart with a lanyard, then use that lanyard as a shock absorbency/tether tied to the handle bar wheeling granny cart home. I’ve been looking for the ideal cart to get my groceries in the house in one trip for years. I have had many and stopped using them for various reasons, boiling down to they were more trouble than they’re worth. One problem is that groceries get squashed if they are stacked up so you have to plan how they go in which takes a lot of time in the rain, for example. Another is that once you get them in the house, they have to be somewhere which means more clutter for the elderly who already have a problem with that. You could take the empty cart back to the car in the rain or leave it sitting by the front door so you won’t forget it next time, which is a nuisance. If you store it back in the car you have to listen to it rattle or slide while you drive to places besides the grocery store and there it is when you want to use the space in the cargo area for something else. If you put groceries in the cart while it’s in the back of your SUV then it’s too heavy to lift to the ground. It just seems like there is no easy and practical way to avoid the strain and inconvenience of handling the physical aspects of grocery shopping. What I’m doing right now is taking in the things that need to be in cold storage and the things I need that day, then taking my time getting the rest. I have not tried the wagon type yet but it seems to me that it might be the better design since groceries could be spread out more avoiding pressure on delicate items and would also be easier to sort when putting them up. As for the idea that cars are something we are going to have to use less in the future you had better convince auto makers that we won’t pay $30,000 for an occasional ride. Thank you very much for writing this article. Saves me lots of time from having to research rolling carts on my own. I take the bus and am thinking of getting the Roadrunner 3-wheeler. The one that hangs bags look cool too, but I wonder how itd hold up to 10 min walks to my apt. Might break or get heavy. Thanks again! I love finding sites like yours that point me at exactly the info I’m looking for. Looks like I won’t be getting the Roadrunner or Hook n Go afterall. Reviews say Roadrunner falls apart, and Hook n Go bends under weight. Plus both have lousy wheels. Inline skate wheels are sounding the best, but the only one I’ve found is Western Pack, and it’s currently out of stock. Do you know of any really good, sturdy, long-lasting rolling shopping bags that are decently slim for aisles of bus? Just presented to a group of seniors at our Wabano Native Health Centre in Ottawa, and showed off my personal cart-on-wheels that I bought at the Great Glebe Garage Sale (world’s largest and most successful one-day traffic-calming event — drivers get no respect and have to crawl along the streets of this downtown neighbourhood crowded with bargain-hunters on foot). I had never seen the model before. It has a folding seat on the opposite side from the bag. Although it has “Broadstone” on the front, I have not yet found it on the Web, although I have found other look-a-likes). It is nicely designed with the bag fully insulated for hot and/or cold items). Thankyou for a comprehensive, well written article. KUDOS ! Broadstone folding wagon was designed for camping. Looks durable and pretty cool. Really appreciate this post. I do much of my grocery shopping via backpack, but I always imagine the voice of my late mom chiding me for carrying heavy stuff. She was a non-driver and a big rolling-cart user; I haven’t been ready to go there yet. But I can probably get behind some of these new models. Thanks! Is there a way to sturdily hook a Granny Cart to a rear bicycle rack, or would that make for exciting moments? Where I live, the vast majority of bike carts and granny carts are being pulled by homeless people. Is the prevalence of homelessness something that the fossil fuel PR people are secretly pleased about? Because, although I hate to say it, it does make a difference. There is a hardware store by me that fixed the wheels on my Honey-can-do cart. All the plastic nuts, washers, bolts… I had replaced with metal ones. Wondering when the personal “granny cart” first appeared–you speak of your grandmother using one in the ’60s. I remember my dear mother lugging stuff home in her arms in the mid-’50s. We now old people use our cart all the time in Toronto and are happy without a car. Anyone know whether I could have used my paperboy money to surprise my mother back then? Thanks to Maradel Krummel Gale for supporting a sustainable Northwest.